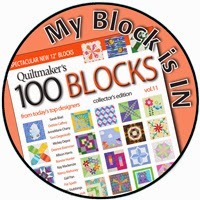 Today is my stop on the blog tour for Quiltmaker's 100 Blocks, Volume 11. My block, #1099 in the magazine, is a variation on rail fence, named Off the Rails. I found my inspiration from a picture in one of Kaffe Fassett's beautiful books, Quilts in Morocco. See that tile in the background? I modified the idea and this is the block I came up with. The construction is super easy. Four rail fence blocks with triangles in the corners. Make four blocks and you get something that looks like this--a great mini quilt idea. Get a head start on the holidays--it would look great in red, green and white! I also tried the same idea with yellow, black check and solid white. It changes the whole look, so it's a very versatile block. As always, Quilty Pleasures is featuring great giveaways during the blog tour and listing all of the participants for each day so you will want to make sure to stop over there. Quiltmaker Magazine has generously offered to give away one copy of this issue to one of you, so leave a comment and let me know if you ever work with solids, or prefer to stick with prints. For all the blog tour stops and more giveaways, hop on over to Quilty Pleasures blog. I'll be picking a winner for the magazine on Saturday, May 9, so make sure I have contact information, and thanks so much for stopping by! This giveaway is now closed. The winner is Vicki in MN, who said: I have worked with solids just a teeny bit so far. I love the look for sure! I like all the variations of your block! I like the simplicity but the beauty of this block. It does indeed Pop. P.S. I'd choose prints (preferably tone on tone) every time but solids are useful, too. I like the ease of sewing in this block. Beautiful! I mostly use prints, but I am more and more tending to sew with solids. I mostly use prints, but do use some solids. Great graphic block! Love your block! Most of the time I use prints with an occasional solid added. I rarely use all solids in a quilt, but I am seeing more and more patterns that are using all solids. I use mostly prints. I'm especially fond of low volume black on white as background. Fun block! That's a great block, I like the movement. I like working with blenders rather than a pure solid and seem to be heading in that direction more. Modern quilts use a lot of solids and our guild does a lot of lottery blocks so now I use more solids than I ever have in the past. Sincerely, Paula K.
I haven't worked with many solids, but I use a lot of tone on tones to "read like solids"
I've started working with a lot of solids lately. I like the way they can stand on their own as well as play nicely with prints. Pink love the simplicity of your block. I like working with fabrics that I think will work best for the pattern or theme I want to make. Thanks for sharing and the chance to win. I have incorporated solids, but have not done a true total solid quilt. Congrats on your wonderful block! I have never made a completely solid quilt but do use solids with prints. Thanks for a chance to win. That is a lovely block! I normally use prints but just bought a FQbundle with blue to green solids. So lets see what i will sew with them,lol! I love working with solids, but prints excite me too. Never met a fabric I didn't like! I have worked with solids just a teeny bit so far. I love the look for sure! I prefer prints and batiks. Solid colors just seem flat to me. Your block is very doable (so many of the others are way to complicated with too many pieces). I have done some solids and what I like about using them is, I can practice my free motion on them and have fun with designs, since they show better. fun block and good eye in seeing those tiles as a potential quilt. I only use solids once in a while, mostly prints. I am a wild kind of gal, lots of color! What a great version on a Rail Fence block! Especially when they are all together~solids are my main 'squeeze'! For some reason I'm more inspired looking at solids than prints! I love, love, love, your block. I use solids for sashing and small borders. I would like to make a two color quilt one day though. Clever block, I like it a lot and can see it in a variety of applications including QOV or baby pastels. I work with both solids and prints, sometimes exclusively in a project and sometimes together in the same project. It just depends on the total palette that projects needs; sometimes a solid is a refreshing break from a lot of busy pattern. I love the look of solids, but I'm usually doing a combination of prints and solids. Gotta do one all solids---on my to-do list! I prefer prints; but, I like prints that reads as solids too! You have a great versatile block. You have so many color options that is a block you will make over and over again. I like working with both solids and prints. Thank you for being a part of the QM's 100 Blocks, Volume 11 blog tour, sharing your creative block with all of us and the chance to win a copy of this awesome, priceless magazine. I haven't made anything with just solids but combine them with prints quite a bit. I love your block and am thinking of lots of different ways it could be used. My daughter is just learning to quilt and this would be a great block for her to try, too. I've made a few just solids quilts, but more often use prints or prints with solids. Cute block and thanks for the chance to win. Clever you! I have a really similar tile photo from a local restaurant in my file! Great block design, Cindy. I'm working more and more with solids and with that gorgeous box of DS solids staring at me I need to get busy! I do usually work with prints, but like to use solids as my co-star. Saw your post on Instagram :-) Congrats on being included in 100 Blocks! I work with both prints and solids. Lately I have been doing some solid improv blocks with my scraps and have had so much fun with it! I work solids and prints in to a quilt to give it the extra pop ! You modified the idea and came up with such an amazing block. I enjoy working with either solids or prints or even both. Thank you for being a part of QM's 100 Blocks,Volume 11 Blog Tour and the chance to win a copy of this amazing magazine. Lovely block! I like prints but solids seem much more dramatic! Ya know, I love how solids and prints mix in a finished quilt - although, I don't like to work with solids. I can plow through the piecing, using solids, and really don't like how a finished top looks - until it's quilted. Then, a solid really lends depth and character to a quilt. I have always used prints, but now I have seen how stunning solids look and your block sure shows how great solids look. I work with solids occasionally, shot cottons a little more often but mostly I use prints. Congratulations on the publication! Although I enjoy seeing quilts made from solids, I tend to use tonals with sort of print that read as solids. I like using prints and tone on tone to give my quilts some personality. Such a wonderful block! There will be lots of ways to use it. Thanks! I like your twist on the rail fence block. Hope to WIN a Copy of Volume 11. I've seen a few blocks already I want to make into QUILTS! That is an amazing twist on an easy block - I have to try that. Fun, versatile block! I especially like how it looks in that version with the gold. I have not sewn with solids very much except in adding black. Will have to give it a try. Thanks for joining the Quiltmaker blog hop. What a fun block. I like all the different colors you made your block. I usually use prints as I feel that I can make a more versitile block with them. Thanks for sharing. I love your block! I prefer to use solids, but recently I have been trying mixing some prints into my blocks. Thanks! I love your block! I use solids a lot; built up a collection when I was making grandmother's flower garden hexies. I really like to use solids for sashing, narrow borders, and bindings. They often add the contrast and/or continuity to the other fabrics in the quilt. And solids are great for kids' quilts. and to show off quilting. I prefer prints, as they add texture and movement. Don't get me wrong. I have seen some beautiful quilts made with just solids. But you have to have the right color combination. When I try to put solids together, something is missing, and I go back to prints. I enjoy working with solids. I made a quilt out of different shades of tropical blues. I have by far received more compliments on that quilt than any other I made with print fabrics!! My go to fabric seems to be tone on tone, marbles. Fabrics that read as solids. I use solids and I like them but I have yet to make an all solids quilt. It's on my to-do list though! I started with solids, so they will always have a special place in my heart; but I enjoy using prints these days. I've only recently started using solids. I'm really more of a pattern person myself. That's just the way I was taught years ago. Great block you've designed. Congratulations on getting it into the magazine. I love using solids... Your Off the Rails Block is very striking! Congrats on being "published"! I use solids just like any print: if it works, the color works, it gets used. Thus many of my projects have blends of both solids and prints. I use solids, tone on tone, prints, whatever is in the stash. Your Off the Rails block is very good! Thanks for the chance to win a copy of the magazine. I sometimes work with solids but I prefer prints. I made only one quilt with hand dyeding fabrics - they are more batics than solids! I usualy mix both. I have worked with solids. I love working with both, especially in combination. I love working with prints, but sometimes it's nice to have solids to help highlight the colors in the prints. It's nice to have a mix. I'm building up my solids (Kona) so that I can make a pixel quilt! Love your block. I've used solids a little bit, but I prefer to work with prints that read as solids. Love your geometric block. Thanks. I'm learning to like solids, but prefer tone on tone for blenders. Great Block!! I really love the yellow, black, and white fabrics you used. Love your block!! Thanks! I mostly use prints but often use a solid as my background fabric. Your block is so pretty with the brigh solid colors. I have been using more and more solids all the time and really like the effect of them. Kona is one of my favorite. Thanks for sharing and having such a great give away. I have worked with solids. My favorite is to combine them with prints. Love your block! I don't usually use 100% solid - prefer more of a marbled solid and adding them to prints. Like what you've done with your block. Thank you. I have one quilt which is solids only two colors though. Which reminds me I probably need to get back to work on it. Cute block. I have worked with solids. I like the AMB fabrics. But non-solid fabrics make up the major part of my stash. I thought I had already commented, but it doesn't look like it went through. I am using more and more solid fabrics in my quilts. Started quilting with no solid colors, but like them more and more. I like to use a combination of prints and solids in most of my quilts. Great block! Seeing the two of them together it's hard to tell it's the same one. Thanks! I usually use prints, but sometimes solids are better for the project. It just depends. Thanks for the giveaway. I usually use only prints but I really like your combination of prints and a solid. I mostly use prints but I am trying to incorporate more solids into them. I have used solids along with prints but never all solids. Nancy A: rangerer@sbcglobal.net. Simple and cute! Great block. Thanks for the chance to win. My go to fabric is usually white on white. Love the versatility of the block. I use solids sparingly, but often. I prefer prints, though use some solids occasionally. I like "tone on tone". I have never used solids, but I collect them! I keep telling myself that I have to actually cut into them sometime. I enjoy solids occasionally, they make you pay attention to value instead of theme on a printed cotton. Lately...it's been 5 batik quilts in a row! I like to use both. It just depends on what project I am working on and the effect I am looking for. I lvoe working with solids - but am fascinated with combining prints off late. I use solids occasionally, but mostly I like the fabrics that read as solid. Your block is cute and fun. I like to work with bright solids. Love your block. I work with both solids and prints. Sometimes I mix them together. This is a fun block and I can't wait to try it. A very fun block; I will have to give it a whirl! I mostly stick with prints, but a solid could show itself occasionally. I like to mix an occasional solid in my favorite scrap quilts to give them a visual resting spot. Fabulous block!! Love how it plays in different colorways!! Definitely need to give this one a go!!! I adore working with solids! Sorry didn't read very well...so glad I came back by!! I use mostly prints, but I like to throw a solid in once in a while. I'm getting bolder with prints. When I find a few that I love, then I have a hard time cutting them up! That said, I still like the block designs to spotlight first. So I use a lot of blenders, solids, and tone-on-tones prints. I think this could be intriguing and secondary designs could be great! That is a darling block! I'm not much interested in solids. Kind of like instrumental music to me - just better with lyrics. But can't do without them - they give the eye a place to rest. I've recently started using solids and I'm liking them a lot. I do own a collection of solids and have a project planned. I have not worked with them yet. Congrats on a fabulous block! I have not made a block with just solids - need to! I mainly work with prints. I use "solid prints" for solids- tone on tones etc. Nice block! Right now I am in a polka dot phase - there are so many to choose from these days! I occasionally use solids to set them off. I do use some solids in my quilts, it helps break up the prints. Love the block, the colors are so vibrant paired with the black. congrats on being chosen to be in the magazine. I like more solids and just a few prints to mix it up! I like solids or fabric that reads as a solid. I just love this Block Tour....always look forward to it! I usually use prints, but do have a small stash of Kona's and Cherrywood's to throw into the mix. Mostly prints but I would like to try using solids. I have just begun to collect solids as I saw a couple of quilts I love that are made from them. I've worked with both - tend to work with prints with small figures or tone on tone. I've never done a quilt with all solids. I have not used solids much previously, but am beginning to be attracted to them in the new patterns and ideas featuring them. I haven't used solids other than as a break between really busy blocks - it seems a bit too like colouring with fabric - and I like the interplay of patterned fabric with the geometry of the block. I have started to use solids and enjoy the results.This spring I've started to collect dots and can't wait to get started using them. I worked with solid when garment sewing, but need to venture there for quilts. I've never worked with solids before! I'm a new quilter! I do use solids, but so far only as backgrounds and borders. I love your interpretation of the tile in the photo Cindy! I am naturally drawn to prints rather than solids, but I am slowly adding solids to my stash. I've always used primarily prints with bits of solids thrown in. Have always used prints but love seeing quilts in solids so I've joined a monthly solids colour club to build a solids stash. I've never made an entire quilt using solids, but I do mix them in with prints on occasion. I actually went to a quilt shop once and asked where the solids were, and was told that I shouldn't use them in my quilt! I tend to be a print girl but am learning to use more solids as I really like the modern look to quilts. Thanks for the chance! I like what I call "muddy" solids. Like Moda Marbels. I have always been drawn to prints. I don't feel as though I have enough experience with only solids. Perhaps I should look at that more. Hmmmm. My morning inspiration is to use solids (something I've not done before for a whole quilt) and randomly choose blocks from this volume to make a quilt for a friends son. How much fun would that be? Better yet I could let him choose the blocks! I love to use solids! Thank you for designing such a cute block and posting great tutorials! I like working with both solids and prints - each can blend well together or make a statement in the design. I definitely need more solids in my stash. Your block is awesome, great job! Love the look of your block! I work with mainly prints ... I like solids, but prefer prints. Love the block! I enjoy working with solids, and like to add a print sometimes to zing it up. Thanks for the chance to win. I'm oh so late in seeing this. Great block Cindy!! Love it. You need to make a whole quilt with it for sure.